Brent Sass won the 36th running of the Yukon Quest International Sled Dog Race at 12:40 Monday afternoon. 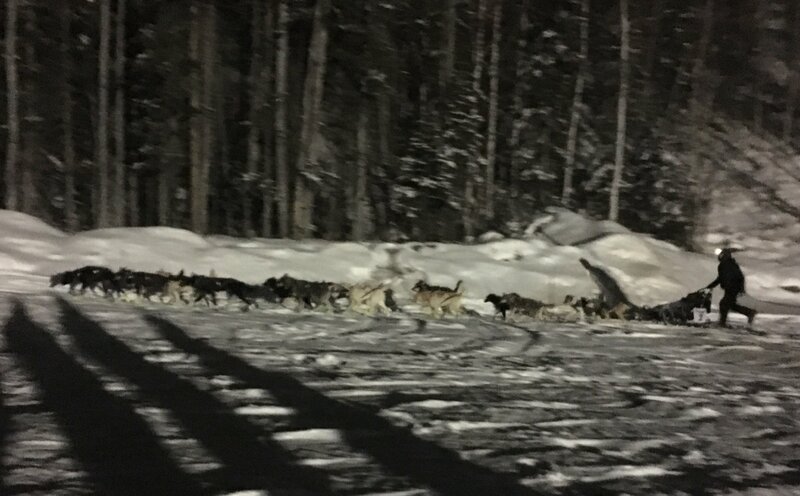 Sass finished with a full team of 14 dogs. It was the second Yukon Quest win for the Alaskan from Eureka. Yukoner Hans Gatt, coming in 90 minutes later, took second place. Alaska’s Allen Moore came in third. 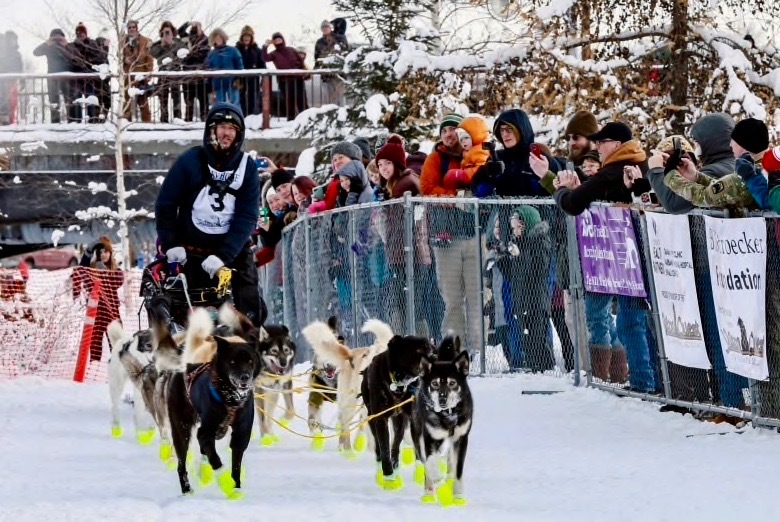 It should be noted that all of the top three mushers have previously won the Quest. 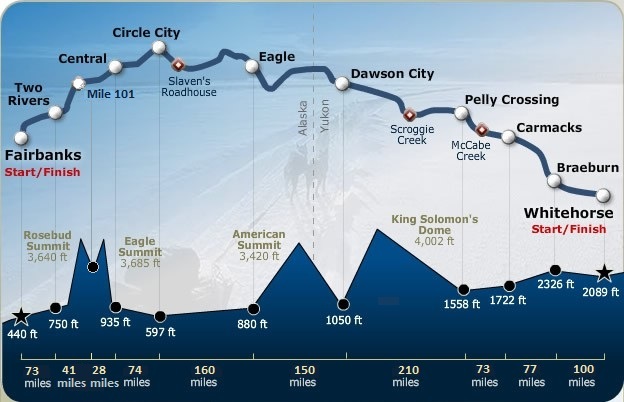 The Yukon Quest travels the historic Klondike gold rush mail and supply route between Whitehorse, Dawson City and Fairbanks. The 2019 race started on February 2nd, with 30 teams. Three teams have dropped out. 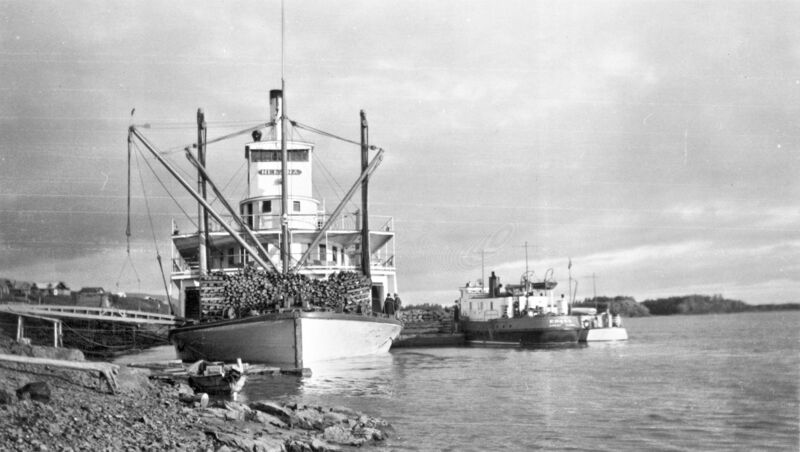 In 1957, the SS Nenana was brought to Fairbanks. She was docked on the Chena River and became a restaurant and boatel. 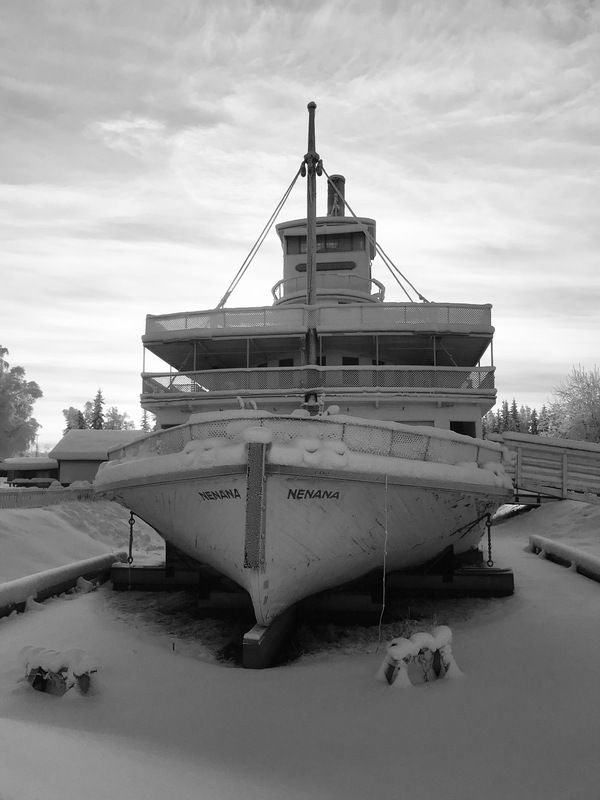 By 1960, her new owners were not making enough money in the venture, so the Nenana sat unused until 1965. During that time, souvenir hunters hit the old sternwheeler hard. 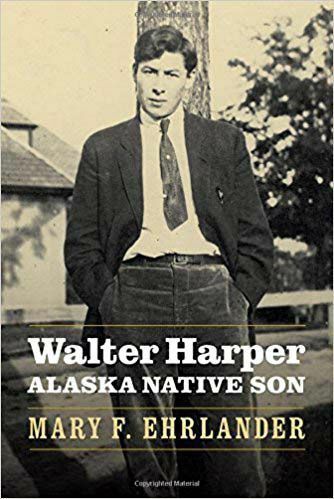 The 100th anniversary of the purchase of Alaska was closing in at that time. 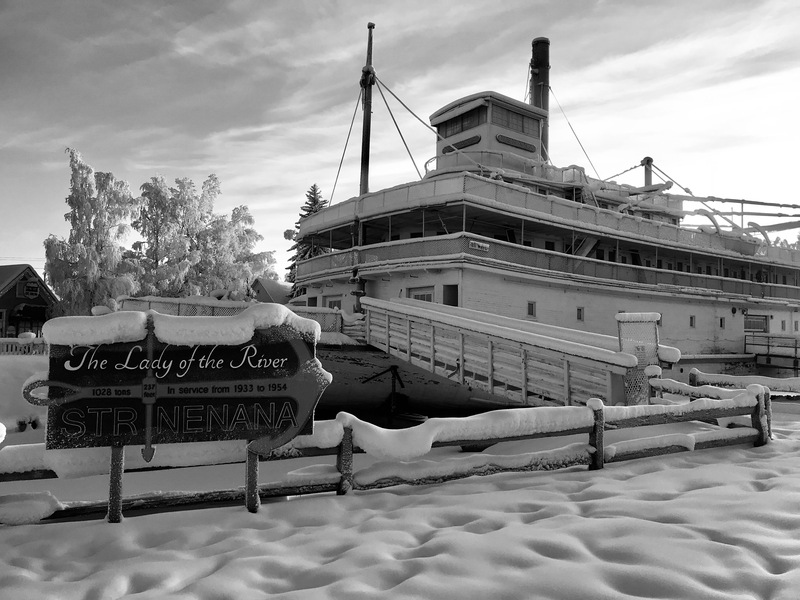 “Alaskaland”, a borough park dedicated to Fairbanks history, had just opened, and the SS Nenana would be a welcomed addition. 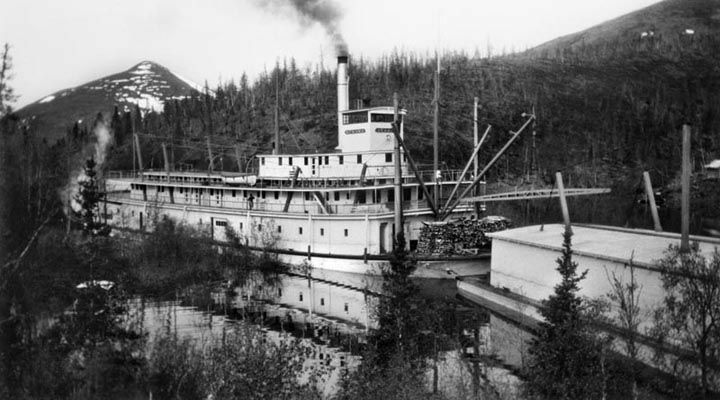 A channel was dug from the Chena River to the park, and the old sternwheeler was floated in. That is where one can find her today. In 1986, the Nenana saw an extensive restoration. Working off of old photos and the original floor plan, the renovation took six years. 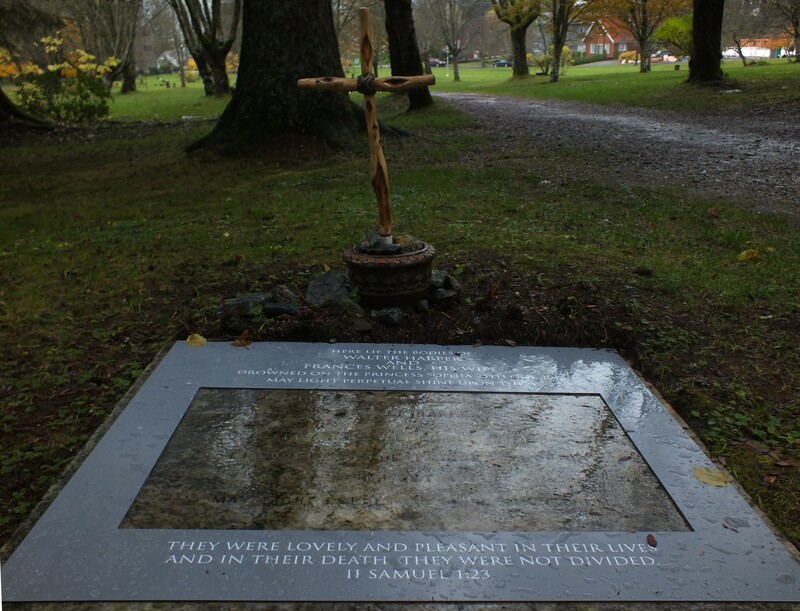 Some original items from the ship were found, others had to be fabricated. 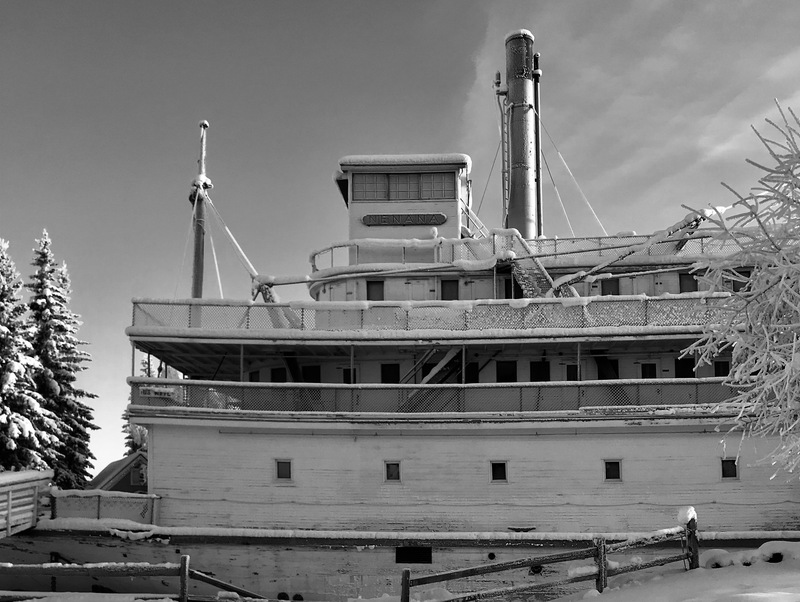 The SS Nenana is one of only three steam-powered passenger sternwheelers left in the United States, and of the three, the Nenana is the largest. She is also the first sternwheeler to be built from blue-prints. Time and the elements have once again taken their toll on the Nenana. Recently, the borough has closed the interior of the ship to summer tours. 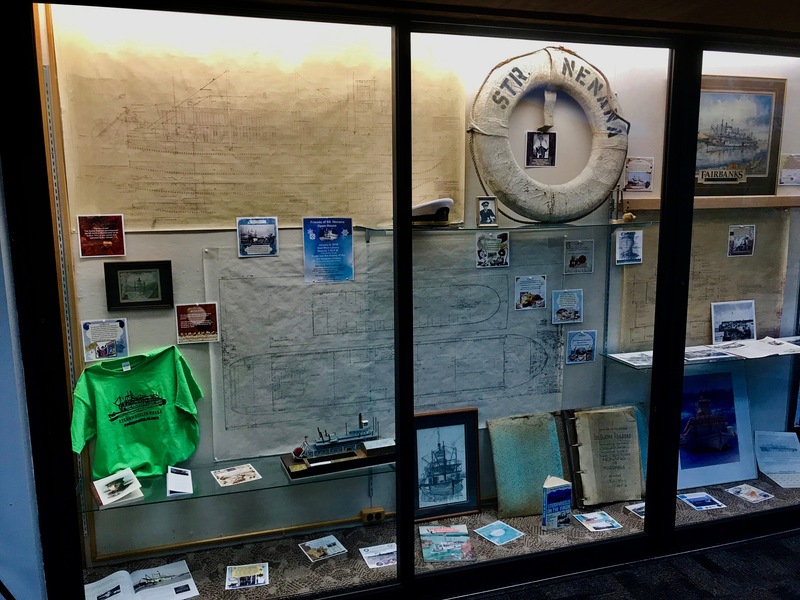 Another renovation of the old sternwheeler looks to be on the horizon. Without it, the ship will be dismantled. 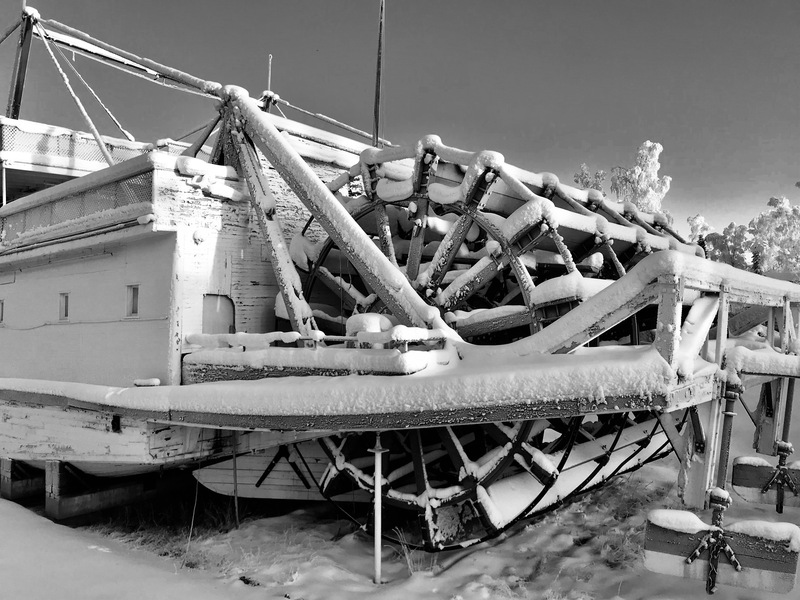 The “Friends of the SS Nenana” are gearing up to “stabilize and restore this one of a kind piece of history”. The Alaska Highway has been closed due to an aggressive fire just south of the Yukon border in British Columbia. The community of Lower Post, BC has been evacuated. The town of Watson Lake is taking in displaced residents and stranded travelers. The fire, which is believed to have been started by lightening, is approximately 4000 hectares in size. There were 14 firefighters and an air tanker working the fire as of the last update. Heavy equipment is currently being used to protect the community of Lower Post. The fire is not contained, and the highway is expected to be closed for several days. The road is closed at KM 823 near Coal River to KM 968 near the Yukon border. 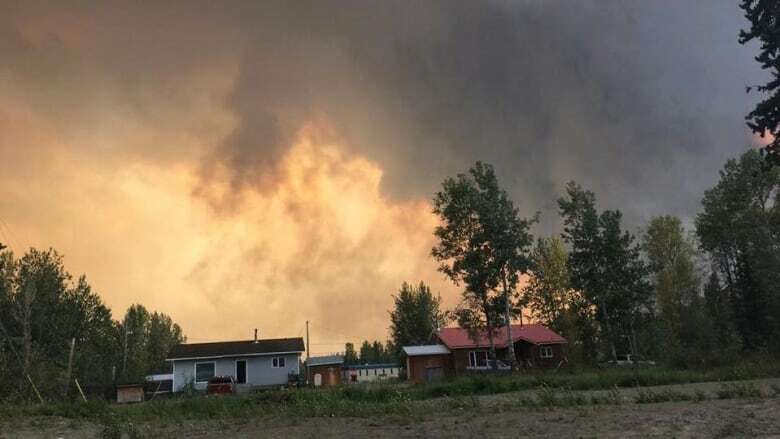 The Alaska Highway has also been closed at KM 133 near Wonowan, BC and KM 454 near Fort Nelson, as well as between Fort Nelson and the Laird River. Travelers can still drive to/from the Yukon using the Stewart Cassiar Highway. It’s a route I highly recommend! Absolutely beautiful country, but the services are even more limited than on the Alcan. I once took the Cassiar while driving a ’73 VW Beetle, so don’t be discouraged, although I suggest bringing an extra five gallons of fuel. We are in a wet, bubble up here in Alaska, so the news that the Alcan is closed due to fire, came as a bit of a surprise. We had an inch of rain at my place yesterday alone, and the high on Saturday was 55 degrees. Our normal high this time of year is in the low 70’s. Currently, August 2018 has seen 3.54″ of rain fall in Fairbanks, which stands at the 10th wettest August on record. Alaska had 399,000 acres burn this fire season, which is lower than the past three years. The total is 40% lower than the median over the past two decades. The Toe has been stolen. 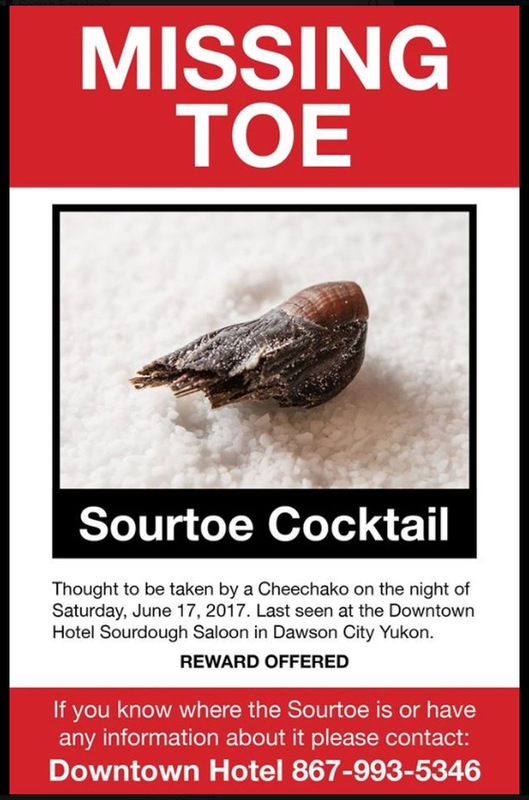 The Sourdough Saloon, located in the Downtown Hotel of Dawson City, has been robbed of one of it’s famed toes. People travel from around the globe to partake in the saloon’s signature drink: The Sourtoe Cocktail. The cocktail consists of a shot of alcohol, garnished with a dehydrated human toe. The cocktail, if not the toe, has a long history. A rum runner bringing booze into Alaska from the Yukon, amputated his big toe after it was frostbitten, preserving the toe in a jar of alcohol. The abandoned/lost toe was found in an old trapper’s cabin by a riverboat captain decades later, and the cocktail officially became a novelty at the Sourdough Saloon in 1973. The rules are quite simple: “You can drink it fast, you can drink it slow, but your lips have gotta touch the toe.” Also, if you swallow the toe, there is a fine of $2500. The fine for swallowing was only $500, but a man intentionally swallowed the toe in 2013, laid $500 on the bar, and promptly walked out. The toe has been intentionally swallowed twice. In the 1990’s, the toe was stolen twice, but was returned both times. The Royal Canadian Mounted Police confirmed Tuesday that officers were investigating the toe theft. 71,328 Sourtoe Cocktails have been served since 1973. Travelers in the Yukon can still order the Sourtoe, since the saloon has one backup toe. The cocktail will set you back $5.